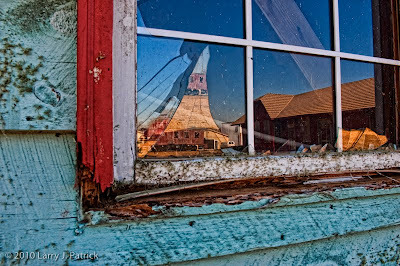 I was walking around this old building looking at all the texture that the weathered paint had produced when I noticed this window with a reflection of an old railroad car and station. I tried several different angles to get the reflection of the railcar and station just the way I wanted. I think this one is all about the angles of the reflections and the saturated colors. Camera settings: Nikon D3, Nikon 28-70mm f/2.8 shot at 28mm, ISO 200, f/11 and 1/125th with a polarizing filter attached. Lightroom—Set white and black points increased clarity and vibrance. Photoshop—used Topaz adjust to add greater detail and saturation of color. At first I did not see much in this photo, however upon closer inspection I found multiple layers of interest, different reflections of the same subject, different buildings, contrasting color scheme. I do wish that the modern buildings were not in the reflection. Without them, you would have a more unified photo. Likewise I question the amount of frame and building you included in the image. It seems o take focus away from the main subject. I would not have seen this. You seem to see things that most of us do not. However, I am somewhat lost in the photo. Not sure where you want me to look. The framing does not guide me to the subject. Cannot understand what you are trying to do. Do you know what you are trying to do? Charles M is again being hard without offering any specifics or suggestions. I agree with the professor. The photo needs more focus on what is the subject.